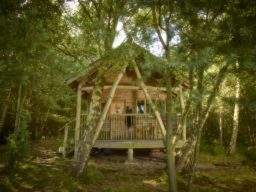 A two night digital detox, staying in a hand built, off-grid, wooden tree lodge, in a woodland setting on the edge of the moors at Swinton Bivouac. Unplug and unwind, find space to clear your mind, relax, recuperate and recharge your own energy with sound baths, mindfulness forest walks and reiki drumming around the campfire. Access to the award winning Swinton Country Club & Spa also included.